Free Palestine - Stop the Killing - Stop Arming Israel. Tuesday 5 June. 17.00 - 18.00 / 5 - 6pm. Outside Debenhams, Hastings town centre. There has been a call-out by a number of Palestinian organisations for local actions on June 5th. This date marks the 51st anniversary of Israel's occupation of Gaza, East Jerusalem and the West Bank - and the end of the Great March of Return campaign. Since March 30, 115 unarmed protesters (including children) have been killed by the Israeli military in Gaza. Some were shot in the back. 13,330 were injured, 32 suffered amputations. Gaza Killings: Names and Faces of the 61 Killed by Israeli Forces on May 14 and 15. 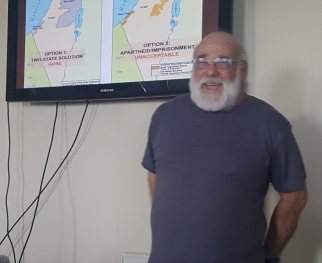 Thanks to everyone who came to our meeting with Jeff Halper, Director of the Israeli Committee Against House Demolitions (ICAHD). Jeff started with an update on Atta Jaber's farm in the Baka Valley, near Hebron. It was once a 100 acre farm - he is now allowed to farm just 12 feet on either side of his house. The sheer vandalism and destruction he has experienced at the hands of the Israeli military and the illegal settlers is shocking. Jeff showed how Israel has effectively eliminated the two-state solution to the Israeli-Palestinian 'conflict' and has produced instead a regime of apartheid. He gave a fascinating vision of the only just solution that Israel has left us with: a single democracy: one country, one citizenship, one parliament. Jeff's talk was followed by a very lively question and answer session. It was good to have such a high turnout at the meeting. This is a video of a talk that Jeff gave in Germany recently with a similar range of topics: Jeff Halper: BDS - one Bi-national Democratic State. The Gaza Freedom Flotilla will be docking at Brighton on its way to Gaza 5 - 8 June. The Hurriya (Arabic for 'Freedom') - part of the International Freedom Flotilla sailing from Scandinavia to Gaza - is scheduled to dock at Brighton 5 - 8 June. A list of activities have been organised by our sister branch Brighton & Hove PSC: Arrival, 5 June. Public meeting 6 June. Departure, 8 June. Al-Quds Day Sunday, 10 June 2018. This is the annual rally and demonstration held in London in support of the liberation of Palestine. Hastings PSC is a supporting organisation this year. Speakers include: Mick Napier and Stephen Sizer. We hope that as many people from the Hastings area can make it. More information here: Video: Al-Quds Day 2018. Meeting: Arms Firms In Hastings. Hastings Against War meeting: "Arms Firms In Hastings - How Can We Challenge Them?" Tuesday 5th June at 7pm. Friends Meeting House South Terrace, Hastings TN34 1SA. More information: HAW website. Jonathan Cook: Fathi Harb Burnt Himself to Death in Gaza. Will the World Notice? 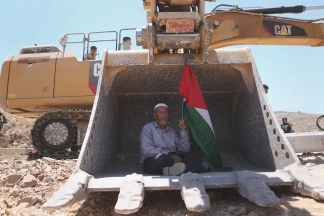 Flotilla carrying Gaza wounded set for bid to break Israeli siege. 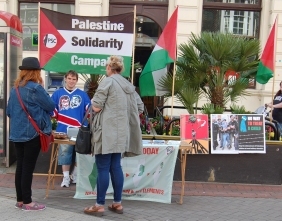 The British Jewish community won't silence our solidarity with Gaza. I Just Visited Syria: Here's What a Syrian Palestinian Woman Wanted Me to Tell People in the West. British arms exports to Israel reach record level. NATO Ships (including the UK HMS Duncan) Arrive in Israel for Joint Exercise with IDF Navy. Nothing to hide? Israel considers ban on filming IDF soldiers, 5yr jail terms for offenders. February 2018: Genocide? As Gaza Dries Out, Israel Turns Off Fresh Water Spigot. 'NYT' columnist says killing Palestinian civilians is....good for Palestinians. Bologna becomes latest Italian city to call for arms embargo on Israel. Donegal County Council To Boycott Israel After Gaza Violence. Artists join the boycott of Israel en masse. Portishead Join Cultural Boycott Of Israel Over Palestine Conflict. Please come along to say hello and support us: any amount of time is appreciated.